3D Elastic Storage, part 3: Five stars to U-Pack! It’s been a busy month. We sold our house in Keene, NH, drove across the country, and rented a house in Santa Rosa, CA. A move like that entails plenty of physical, emotional, and financial stress. The last thing you need is trouble with a fraudulent mover which, sadly, is so common that http://www.movingscam.com/ needs to exist. Luann spent a lot of time exploring the site and Jeff Walker, its founder, wrote her a couple of really helpful and supportive emails. When we realized that a full-service move wasn’t feasible in our case, Jeff agreed that ABF U-Pack — the do-it-yourself company I’d identified as our only viable option — was a good choice. 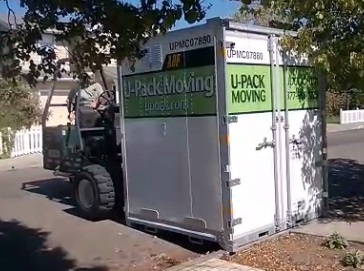 I’ve chronicled our experience with U-Pack before and during the move. Now that it’s done, I’m wildly positive about the service. Every aspect of it has been thoughtfully and intelligently designed. The non-standard size and shape of U-Pack’s ReloCube is, at first, surprising. It’s 6’3″ x 7′ x 8’4″, and the long dimension is the height. As Marc Levinson’s The Box wonderfully explains, standardization of shipping containers created the original Internet of Things: a packet-switched network of 20′ and 40′ boxes. Those shapes don’t meet U-Pack’s requirements for granular storage, transport on flatbed trailers, and delivery to curbside parking spaces. But while the ReloCube’s dimensions are non-standard, the ReloCube system provides the key benefits of a packet-switched network: variable capacity, store-and-forward delivery. In our case, we’ve now taken delivery of the two cubes that held our household stuff. The two that hold Luann’s studio remain in storage until we figure out where that stuff will land. Smaller containers enable that crucial flexibility. All the surfaces are nicely smooth. And there are plenty of slots for hooking in straps. But I wound up using very few straps because I was able to pack the cubes tightly. It’s easier to do that in a smaller space. 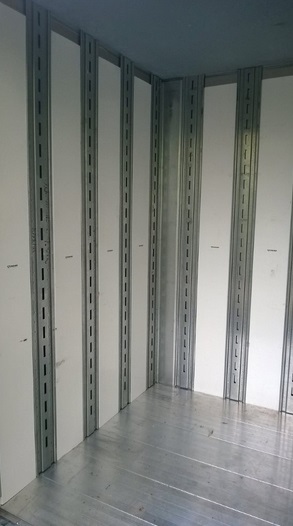 When you lever the doors shut on a tightly-packed container they compress and help stabilize the load. That wouldn’t be a significant factor with an 8x8x16 PODS container but with the smaller ReloCube it can be. 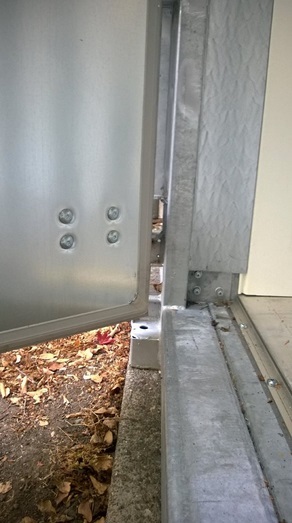 The forklift driver placed the cube’s edge on top of the curb. Not shown in the video is the final tap with the forklift that aligned the cube perfectly. These folks really pay attention to details! I can’t say enough good things about our U-Pack experience. 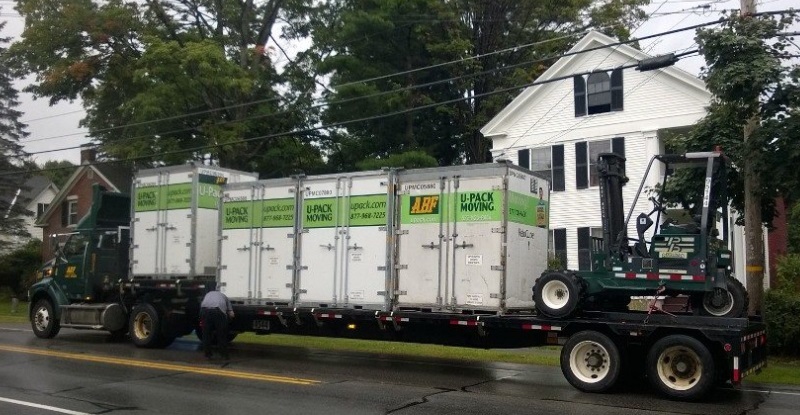 No conventional service offered the flexibility we needed so none was an option, but we did solicit estimates early on and they were astronomical: three to four times the $6300 we paid U-Pack to move four containers across the country and make them available to us on demand. (We’ll also now pay $100 per-month per-container for the two studio containers until we retrieve them.) There was very little paperwork involved. Every U-Pack employee I talked to was friendly and helpful. So I’m giving the service a five-star rating. For me the experience was an echo of a time, fifty years ago, when our family moved from suburban Philadelphia to New Delhi. Here are some pictures of the “sea trunk” that was delivered, by bullock cart, to 102 Jorbagh. But the resemblance between our New Delhi sea trunk and our ReloCubes is, I think, not coincidental. Jon, amusingly coincidental that my family and I just were relocated to Redmond by MS (no Upack, though that is exactly what I would have used myself based on your recommendation and my needs) and some 40 years ago moved into and lived at 196 Jor Bagh Road! It is fascinating to see how Jor Bagh had changed even in that intervening period and of course it is drastically different today. I see it spelled both ways, but “Bagh” is a garden, so sticking them together looks like “MarvinGardens” to me :-) Probably a lot fewer itinerant performers, which is probably better for the kids and the animals. The Delhi metro now comes to the intersection of Jor Bagh road and Aurobindo marg, by the fire station, so getting there from around Delhi is very convenient. I love the old picture in New Delhi. It’s amazing how things haven’t changed much in 50 years when it comes to transportation. You mentioned that you got a bunch of quotes that were astronomical. Do you remember how long it took you to get those quotes? That has always been a problem for me when I had to obtain various quotes for the same shipment. It always took forever. There is a site called ShipHawk.com that was able to provide and instant quote that’s guaranteed. Pretty cool stuff actually. Did you see any hidden fees when you used U-Pack? All and all it seems like a great service for the DIY person.